AnandTech talks about AMD's future chips, you can read it over here. 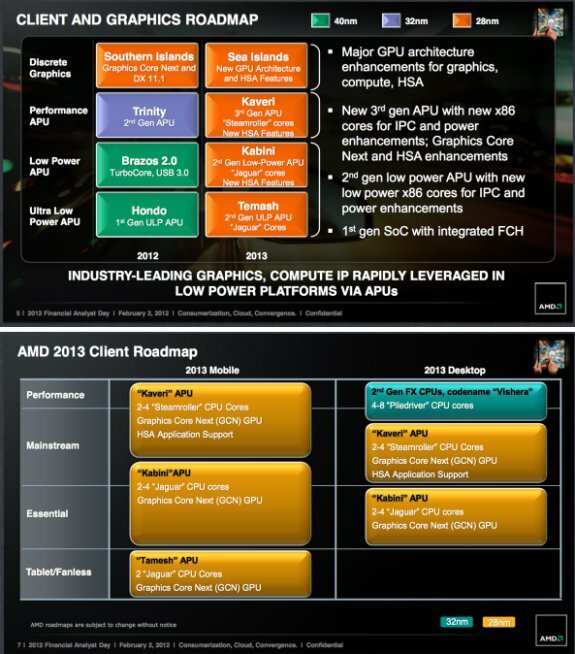 As far as the roadmap goes, AMD already laid out what it hopes to accomplish by 2013. The best way to summarize AMD's next two years is: APUs and servers. On the APU side, we'll get updates to all of the current lines this year (Trinity & Brazos 2.0), but we'll also get a new 4.5W APU (Hondo) aimed at the Windows 8 tablet market. Now 4.5W is a bit high for a tablet but AMD has plans to bring even lower power architectures to market in the future. Next year we'll also see the first single-chip solutions from AMD: Kabini and Temash will integrate the I/O controller (SATA, USB ports, etc...) on-die. Intel is doing something similar with Haswell..